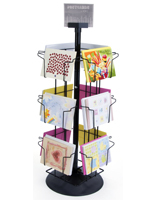 These Greeting Card Displays are 1/8" Thick Acrylic Wire Shelves. 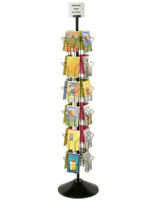 These Storage Racks Stand 68" tall and Accommodate 5" x 7" Greeting Cards. 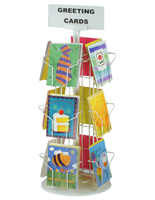 These Greeting Card Displays are Economical! Rotating construction makes browsing easy! Sturdy white wire and white base looks fresh and clean! 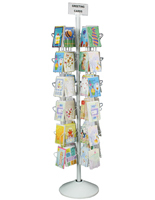 These greeting card displays that are floor standing are made of white acrylic wire. These wire display racks that have a revolving base are floor standing. 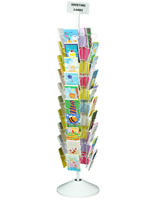 These greeting card displays, also known as shop accessories, have (24) pockets and accommodate 5" x 7" greeting cards. Each of these pockets is 5 1/2"w x 4 1/2"h x 1 1/2"d and has a sturdy white plastic base that is 20" in diameter. Atop these greeting card displays for a shop is a sign holder to house a 1/8" thick plastic or acrylic sign for custom messaging. Also included in these storage accessories is a plastic sign holder, which mounts to the top of the display and holds your 1/8" thick plastic or acrylic sign. 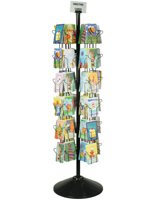 These greeting card displays that are card kiosks stand 68" tall. No tools are needed for assembly! 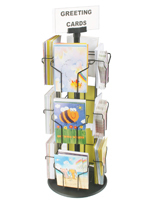 These greeting card display fixtures are shipped unassembled to save you money. These units assemble in minutes with no tools required!! These industrial wire display racks are not only inexpensive, but they make quite an impression on the floor of your shop!